Corrie Ten Boom was taken prisoner by the Nazi’s for hiding Jews in her home. 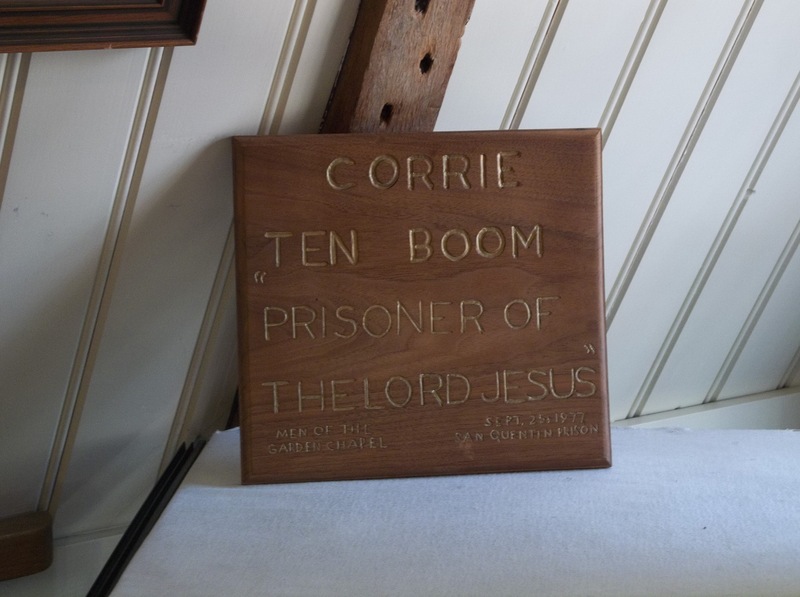 Corrie ten Boom grew up in Haarlem in Amsterdam and was the youngest of four children, born to parents Casper (1859–1944) and Cornelia (died 1921 of a cerebral haemorrhage). She had two other sisters, Betsie ten Boom (died 1944 in the Ravensbrück death camp) and Nollie (died in 1953). Her brother, Willem ten Boom, was born in 1887 and died in 1946 of spinal tuberculosis. Corrie’s three maternal aunts also lived with her family. Bep died in the early 1920s, of tuberculosis; Jans died in the mid-1920s, of diabetes; and Anna, who took care of the children after the death of their mother, was the last to die, in the early 1930s. Corrie’s father worked as a watchmaker; a profession that she followed in becoming the first licensed female watchmaker in the Netherlands in 1924. Corrie and her sister Betsie never married and had lived their entire lives (until their arrest) in their childhood home in Haarlem. Corrie ten Boom also ran a church for people with mental disabilities, raised foster children in their home, and did other charitable works. In 1940, the Nazis invaded the Netherlands. Among their restrictions was banning a club which ten Boom had run for young girls.In May 1942 a well-dressed woman came to the ten Boom door with a suitcase in hand. She told the ten Booms that she was a Jew and that her husband had been arrested several months before and her son had gone into hiding. As Occupation authorities had recently visited her, she was afraid to return home. Having heard that the ten Booms had helped their Jewish neighbors, the Weils, she asked if she might stay with the family. ten Boom’s father readily agreed. A devoted reader of the Old Testament, Casper believed Jews were the ‘chosen people‘, and he told the woman, “In this household, God’s people are always welcome.”The family then became very active in the Dutch underground hiding refugees They provided kosher food for the Jewish refugees who stayed with them and honored the Jewish Sabbath. Thus the ten Booms began “the hiding place”, or “de schuilplaats”, as it was known in Dutch (also known as “de Béjé”, pronounced in Dutch as ‘bayay’, an abbreviation of the name of the street the house was in, the Barteljorisstraat). Corrie ten Boom and sister Betsie began taking in refugees — both Jews and others who were members of the resistance movement, being sought by the Gestapo and its Dutch counterpart. While they had extra rooms in the house, food was scarce for everyone, due to wartime shortages. Every non-Jewish Dutch person had received a ration card, which was required to obtain weekly coupons to buy food. Thanks to her charitable work, ten Boom knew many people in Haarlem and remembered a couple who had a disabled daughter. The father was a civil servant, who by then was in charge of the local ration-card office. She went to his house one evening; when he asked how many ration cards she needed, “I opened my mouth to say, ‘Five,'” ten Boom wrote in The Hiding Place. “But the number that unexpectedly and astonishingly came out instead was: ‘One hundred. '”He gave them to her, and she provided cards to every Jewish person whom she met. Because of the number of people using their house, the family built a secret room, in case a raid took place. They decided to build it in ten Boom’s bedroom; as it was in the highest part of the house, people trying to hide would have the most time to avoid detection (as a search would start on the ground floor). 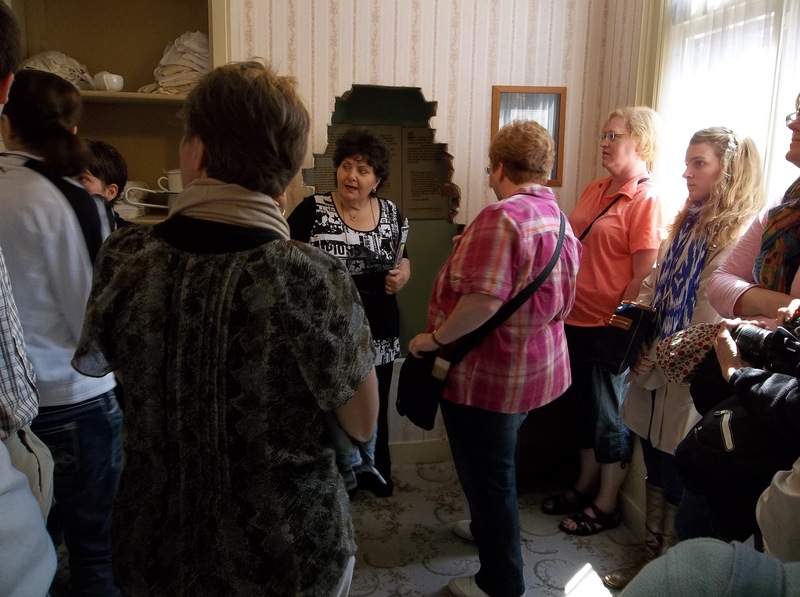 A member of the Dutch resistance designed the hidden room behind a false wall. Gradually, family and supporters brought building supplies into the house, hiding them in briefcases and rolled-up newspapers. 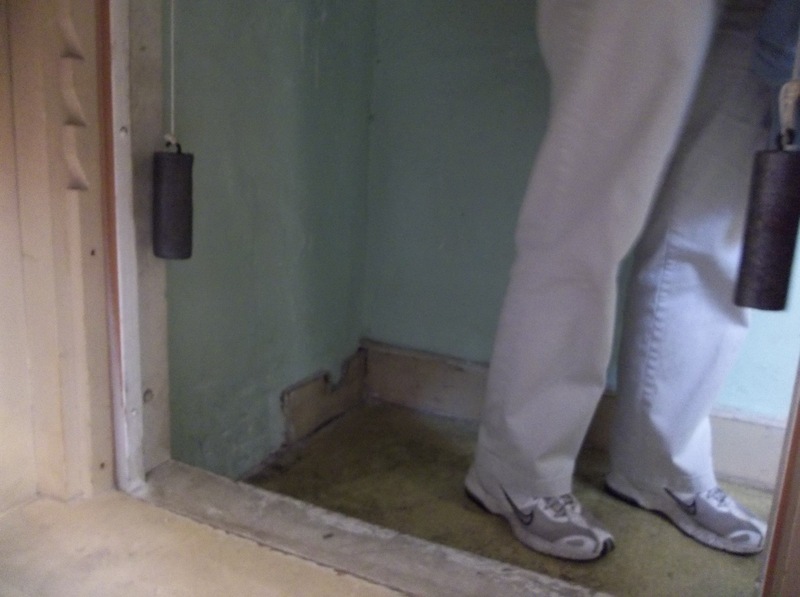 When finished, the secret room was about 30 inches (76 cm) deep, the size of a medium wardrobe. A ventilation system allowed for breathing. To enter the secret room, a person had to open a sliding panel in the plastered brick wall under a bottom bookshelf and crawl in on hands and knees. In addition, the family installed an electric buzzer for warning in a raid. When the Nazis raided the ten Boom house in 1944, six people were using the hiding place to evade detection. This entry was tagged photography, The Netherlands, travel. Bookmark the permalink. Oh YAY – Corrie Ten Boom is for sure one of my Hero’s. I love to hear her story told. I heard her speak at least once when i was younger. I have her story, The Hiding Place in audio drama format, and i have listened to it repeatedly. It is so moving. thanks for the pictures. I would love to see it in person someday, but this helps me imagine what it must have been like to hide away. It demonstrates such courage and faith – to defy such a wicked oppression. The Ten Boom’s were amazing Christian folk. I got to tour the house the first time I was in Holland. My sister’s boss is a docent there. I put pictures of St. Bavo’s in a recent blog called “Ornate”. That was the Ten Boom’s home church in Haarlem. Goodness, I knew nothing nothing about this – thank you. You are welcome Mrs. Carmichael. 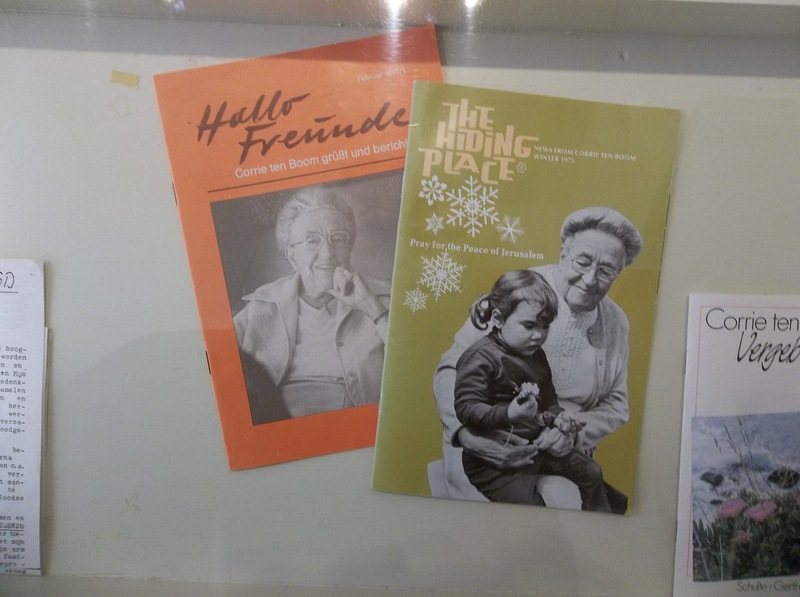 Corrie’s story can be read in her book, The Hiding PLace. It is a Christian classic and well worth the read. I never tire of hearing this story–it’s both horrible and miraculously filled with God’s Sovereign Presence. I can’t imagine the fearful horrors, nor the Huge Faith-Courage–I doubt I could be so heroic, certainly not in my own strength. “God only gives us our ticket when we are ready to board the train.” Corrie Ten Boom. We only have strength to do what God calls us to and may God grace us never to need to walk where Corrie walked. I guess that line about the train ticket must be the most remembered of Corrie’s–it helps me a lot. Corrie ten Boom is such a powerful story-one I, too, never tire of hearing. The faith and strength it must of taken to get through such an experience and the forgiveness that comes later truly amazing. Only in His strength and power can forgiveness come. Thanks, Pastor J, for reminding us that God is always bigger than our circumstances! Amen Deb! I am glad I was able to use this blog to bring out this truth. Corrie Ten Boon has been an inspiration to many for decades. Praise God for her and all He achieved through her. An example of a life dedicated to God beyond what she thought her limits were. Corrie has always been an inspiration to me.